IS THE MARX CASTLE HISTORICALLY ACCURATE? 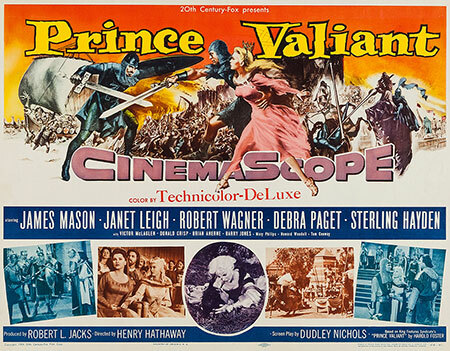 That’s the question we asked, especially after seeing medieval fortress-oriented films like The Agony and the Ecstasy, Taras Bulba, and of course the original Prince Valiant. We also looked at cannon – especially the wheeled variety, considering the Marx version shows up in the three-cannon sets; and drew a conclusion based on fact, not flavored a little by our biases toward Marx. It’s fun history. The kind we like! Will you find any surprises this issue? Have they all been “found” by now? Will this magazine reveal anything new? Why, glad you asked. Yes it will. Is it possible the Prince Valiant figures are actually interactive? 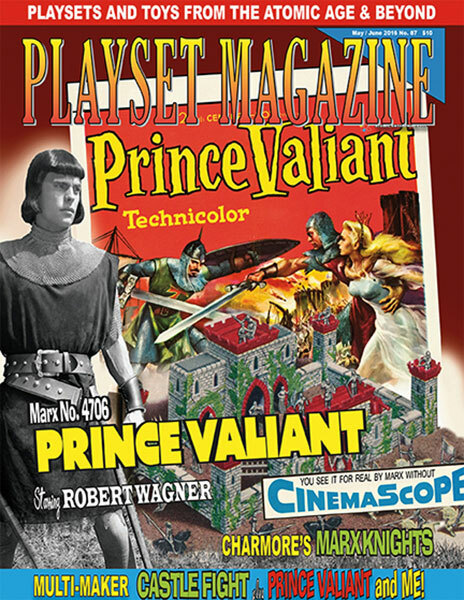 Also this issue its Prince Valiant and Me, professional author and collector Greg Urbach’s orientation tour of the Prince Valiant influence on his early years and the toys he has come to collect and love all based on the Prince Valiant theme and 20th Century Fox movie. •	Keeping the faith and casting a wide net of interest, we are also pleased to bring you “The Mooing Cow” Mystery – SOLVED! For a reader who sent in the query, “Is there any place I can find direct, side-by-side comparisons of the Farm Mooing Cow and the so-called rare Wagon Train Mooing Cow?” We RUSH to end the confusion with exactly such a comparison, alleviating the pain and ending once and for all that particular thorn in collectors’ sides. •	We have a great update from last issues’ very popular Header Bag Story – once again Jim McGough delivers the proverbial Marx goods with a fine tuned update from last issue with even more header bag sets! •	Next we ask you to witness the news section, where we direct your attention to news of the harshest sort: a well-known and liked business is going – out of business. Our hearts bleed. 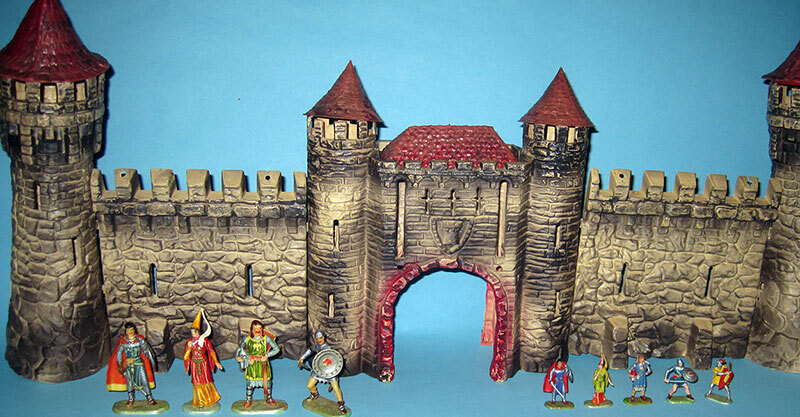 •	It’s Castle VS Castle – one brave collector has dedicated an enormous layout to our most popular castle makers! See the results on his ginormous layout complete with medieval villagers running amok in their village, bridges, and siege-fallen walls. •	Finally, witness for yourself the excitement of the Walls of Troy as LOD delivers the goods on a promised set that will widen your eyes with thrilling size and a very un-intimidating price. Plus we roll out our coveted advertisers’ best ads as we gallop into Spring on steeds of finest white glossy paper, fresh ads, delicious classifieds, and their ax-swinging deals that cut through the EBay clutter to get you toy soldiers the fastest way, the old way: see n’; buy. Lastly folks, we’d like to announce that our new high-def DVD, “The FORT APACHE STORY” is entering the final phases of filming and completion. This has been a long one – editing and post-production actually began back in October, shortly after filming of interviews with our fine hosts ended. Then we asked for and received some great narration by an A-List voice talent (who because of certain rules requests he not be named. Darn.) Next came filming of sets and a new delightful character addition to our personal A-List , “Ranger Bob”. He’s the guy who stands around at Fort Apache and answers questions knowledgeably and with aplumb. Or not! This new video is approaching (but not quite at) the hour and a half mark, and we love it. But then, anyone who loves Fort Apache sets will – it’s a big document on all the main sets (but not all of them – we only gloss over the Heritage and other later sets). But only because of time. We now return you to our regularly scheduled program.